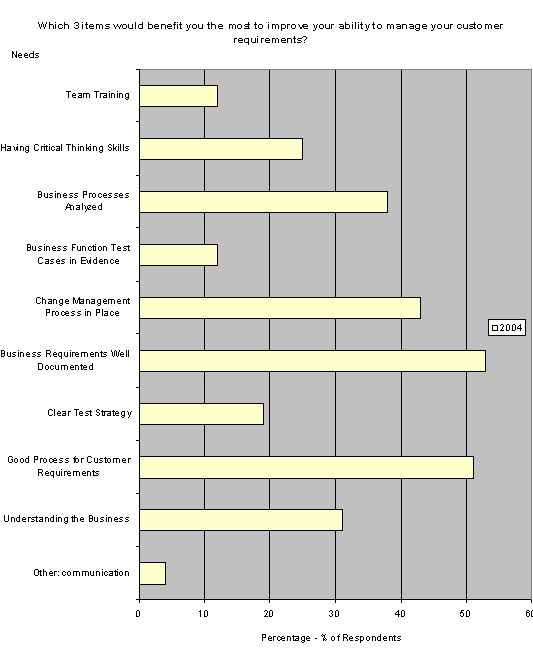 Business Improvement Architect ’s annual research of project managers at ProjectWorld 2004 in Toronto, Canada indicated that ‘Shifting Organizational Priorities’ was the top challenge their organization faces in managing projects. This issue jumped by 8 percentage points versus last year to take the number one position slightly ahead of ‘Lack of Clarity in the Scope of the Project’. 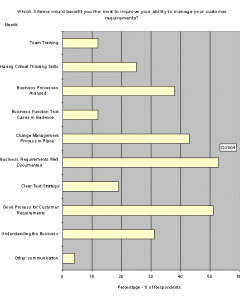 Each of these issues was mentioned respectively forty-nine percent (49%) and forty-eight percent (48%) of the times by the 263 survey respondents. Over the past 4 years, both these issues have consistently been identified as the top two challenges that organizations face in managing projects. The third challenge for respondents was ‘Project Changes Not Well Managed’ (40%) followed by ‘Project Risk Not Assessed or Managed’’ (35%). In our research project managers also identified ‘Training of Project Sponsors’ fifty-four percent (54%) of the time as something that would benefit them most to improve their ability to manage a project. This item saw a significant increase over the prior year by 11 percentage points. As well they said they would benefit from ’Communication Skills’ and ‘Coaching Skills’ (34% each). The ever-changing nature of our economies and organizations creates uncertainty on organizational priorities. One of the most frustrating experiences a project manager can suffer is managing within this environment – while the project is being implemented. We refer to this type of project change as Strategically-Driven Scope Creep. This can seriously impact the entire project. The ever-changing nature of the organization may change the project’s goal, deliverable, budget, or timeline. For example, a project that is critical today is suddenly not as important tomorrow. And the project manager is told to put it aside for awhile and work on other, newer priorities. A change in top management may be accompanied by a change in priorities and even in the direction of expansion and other efforts. For example, a project that progressing at a reasonable pace is suddenly thrust forward. A shorter time line is forced on the project, yet all deliverables, as originally defined, must be met. A new President or even department manager may render a project meaningless in the light of new direction, new services, new products, new technology, etc. Projects are accelerated, slowed down, cancelled, maintained but with different deliverables, etc. Even without the influence of change, management may change their own course. If we could all get into the brains of our senior management group, this challenge would be easy to manage. 1. Immediately inform the team…avoid adopting an anti-management attitude when your project’s goal, deliverables or even its continued life is threatened. Explain why the change is occurring, and then use the change management process to manage the change. 2. Concentrate on executing the change, rather than on less productive and negative activities…do everything you can to channel your team’s energy into the new effort. 3. Revise your schedule and budget…only after the change request has been approved. 4. Revise your project plan…and gain your team’s commitment to the new schedule. 5. Attach the signed Change Request Form to the Project Scope Statement. The final success of a project is measured against the Project Scope Statement plus all attached, signed Change Request Forms. 6. If the project has been cancelled, complete a close-out evaluation report on the project to date. These projects have a funny habit of re-appearing again in one or two years. And although it may be a new team assigned to re-start the project, possibly with different deliverables, if the documentation from this effort has been retained, it will assist this new effort enormously because the knowledge will not be lost. The Scope Statement, once completed, becomes the basis for future project decisions including, in particular, the criteria used to determine if the project (or phase of the project) has been completed successfully. Essentially, this document will form the basis for an agreement between the project team, the project customer and the project sponsor, by identifying both the project goal and major project deliverables. So, why is there a lack of clarity in the scope of the project? We coach many projects in crisis every year. During the initial auditing phase of the project, we ask to review how the project was scoped out. Invariably, we receive piles of documents, files, etcetera, yet there is often nothing that succinctly identifies the scope of the project. To bring these projects back on track, the project team must go back and define the scope of their project as well as gain a clear understanding of the stakeholders’ needs. By defining scope through the planning process, there becomes greater control and the need for project change is minimized. This further reduces the likelihood of risk. Once developed by the project team, the Scope Statement is reviewed and approved by the Sponsor. Then clarity on the scope of the project is obtained. As the project progresses, one may find that the scope of the project has changed. To address this it is important to apply the Change Management Process. Requests for change are added as an addendum to the Scope Statement. However, the Scope Statement itself is not re-written. Project success is measured by the ability to have achieved all the requirements as outlined in the Scope Statement, with all approved Project Change Requests. The approved Scope Statement and Project Plan initiate a Request for Change when there is a need to modify the agreed-upon project scope as defined. Scope changes often require adjustments to cost, time, quality, risk or other project deliverables. These changes must be put back through the planning process, updating plans as needed and notifying stakeholders as deemed appropriate. Corrective action is needed to bring expected future project performance into line with the project plan. The term ”Scope Change” is often used. It refers to anything that will now be different to what had originally been agreed-upon in the original Project Scope Statement and subsequently the Project Plan. The Project Team does not recognize that a change has occurred. They permit schedule and budget variances to occur. Anything that alters the project planned dates, budget, deliverables, or customer expectations must be documented and approved before implementation. Do not go crazy with change requests. Generally, if there is a slippage in the schedule or budget, track these. When it becomes apparent that you will not be able to catch up on these slippages and therefore a milestone will be missed, that is when a Change Request should be completed and approved. The Project Team does not handle change well. They get upset when the sponsor initiates a change rather than submit it back as a change request. The only thing that we know for certain is that the Sponsor will often change their mind for reasons that we do not necessarily understand. Nevertheless, each change can be reflected back to the Scope Statement and therefore given back to them in the form of a Change Request. Often, when they realize the impact that this change will have on the project, they decide not to proceed. The Project Team doesn’t provide options to the sponsor. This may lead to rejection of the change request. If the Sponsor is backed into a corner and told that there is only one option and that is to approve the requested change, then the team must accept the consequences of a “No” response. However, if they provide options to the Sponsor, so if they do not like the first option, perhaps they will accept Option #2 or Option #3. Furthermore, let them know the consequences of not approving any option. How will this impact the project? The more data you can provide to your sponsor, the more likely they will give you some level of approval. Plan appropriate responses to the eventual outcome of a risk. Proper risk management implies that we can control possible future events. Of course we cannot, but it forces us to think about what might prevent success, based on our own experiences. And therefore, what can we do to reduce risk likelihood or to manage the risk, should it occur. It is proactive rather than reactive. Proper risk management will reduce the likelihood of an event occurring and the magnitude of its impact. Projects incorporate a Risk Management Process to reduce crisis management. There will always be some things that will occur but most of these, through sound risk management, can be managed. Assessing and managing risks is the best weapon you have against project catastrophes. By evaluating your plan for potential risks and developing strategies to address them, you’ll improve your chances of a successful, if not perfect, project. Risk Management is continuous. It is not done just at the beginning of a project; rather it is done throughout a project to ensure that high priority risks are aggressively managed and that all risks are cost-effectively managed throughout the project. As well, it provides management at all levels with the information required to make informed decisions on issues critical to project success. Training project sponsors on their role in ensuring project success helps the project manager and increases the likelihood of project excellence. This type of training provides sponsors with an understanding of what the expectation is, on their part, to help manage project issues, to approve project scope and to provide timely approvals. When project sponsors are on side, resources are more likely to be allocated in accordance with project importance, as they tend to continuously use a set of standard criteria to prioritize projects. While sponsors will not be managing the day-to-day details of the project they need to understand their role in ensuring success. For this reason, BIA offers an a series of executive training courses in Project Management that includes training for project sponsors. The training comprehensively covers the issues and concerns around project plan implementation such as the setting of criteria for signing off on Scope Statement approval. There is a need for organizations to link their projects back to their corporate strategies and to train project sponsors to increase the likelihood that projects will survive shifting organizational priorities. Project Management Offices and project managers must understand how each project contributes to achieving corporate goals—which should be found in the strategic plan. What is their strategic alignment? With a process in place to manage change and risk, project managers are better able to cope and deal with these challenges. Similarly, training of Project Sponsors will help to bring them on side so that resources are allocated in accordance with project importance.